With the Vision Coupe, the brand’s designers have created a four-door sedan with the proportions of a classic coupe. The hood is very long and the cabin is set further to the back, creating a very dynamic silhouette with a powerful forward momentum. 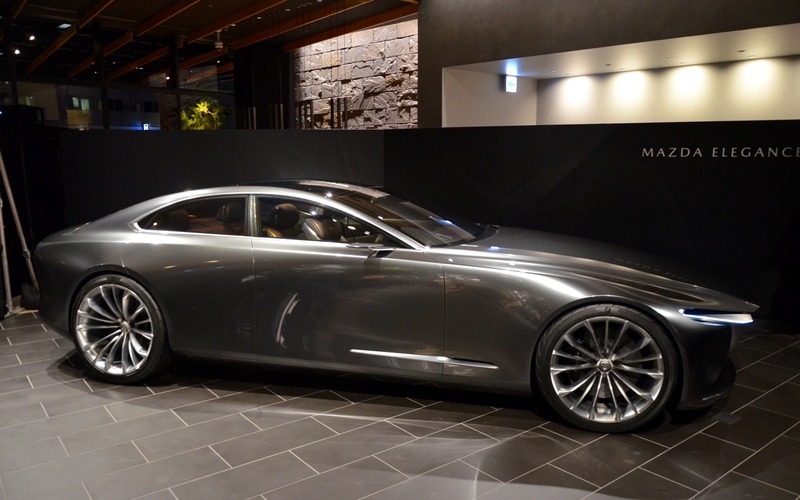 The Vision Coupe features a single axis that runs from front to rear in what Mazda designers call the “one motion form,” while a lot of attention was paid to the play of light across its surface. The front view is very dramatic with a very large grille that extends below the car’s slim headlights and, when viewed from the side, the Vision Coupe displays a very strong and sharp shoulder line. The interior of the Vision Coupe was created in accordance to the Japanese concept of “ma,” which means space, in order to allow occupants to feel safely ensconced in the cabin, but without any sense of confinement. As with the car’s body, the interior of the Vision Coupe has a three-dimensional feel with lines that run smoothly from front to back, creating a sense of speed. In order to maintain a connection between the occupants and the outside world, the large display screens that are now typically found in many vehicles have been replaced with a see-through screen that functions as a display only when required to convey information to the driver. The stunning Mazda Vision Coupe was revealed at the brand’s Design Forum held prior to the 2017 Tokyo Motor Show where the car will make its public debut.